This wonderful wine is dark ruby in color and very flavorful. Enjoy the flavors of black plum, raspberry, jasmine tea, and black pepper. 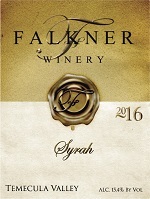 This Syrah pairs well with meal dishes such as lamb, beef, duck, and goose.